Young drivers are to be FORCED to get ID cards when they apply for their first licences. The People has seen sensational leaked Home Office documents revealing the secret plan. It says newdrivers and those applying for fresh passports will be “coerced” into getting the controversial identity cards. PM Gordon Brown has always said the scheme will be voluntary unless Parliament decides otherwise. Shadow Home Secretary David Davis stormed: “This is an outrageous plan. The Government has seen their ID card proposals stagger from shambles to shambles: Now they plan to use coercion in a desperate attempt to bolster a failed policy. Civil rights group Liberty said: This memo confirms that compulsion is the ultimate ambition of this scheme.And it can be achieved by stealth even without the need for further parliamentary debate. The secret document from the Identity and Passport Service is headed: Options analysis - outcome. It says: Various forms of coercion, such as designation of the application process for identity documents issued by UK ministers (eg passports) are an option to stimulate applications in a manageable way. There are advantages to designation of documents associated with particular target groups, eg young people who may be applying for their first driving licence. The report says: universal compulsion should not be used unless absolutely necessary because of the ID controversy. Jacqui Smith has unveiled the UK's new identity card. The credit card-sized plastic cards carried a picture of a bull - in common with other European Union identity cards - as well as five stars drawn from the stars on the official flag of the EU. The card is to be initially issued to people outside the EU renewing their permission to stay in the UK as students or on the basis of marriage. Between 50,000 and 60,000 cards, which will initially cost £30 each, will be issued by the end of next March and ministers predict one million a year will be handed out from 2010. The cards contain the individual's name, their photograph, the card's expiry date and details of how long they can stay in the country. Other information includes people's date and place of birth, their gender, nationality, and whether they are entitled to benefits. Biometric data, including copies of all of the person's fingerprints, will be stored on a special security chip. The card will start to be issued on November 25 to foreign nationals at offices in Croydon, Glasgow, Sheffield, Liverpool, Birmingham and Cardiff. From next year anyone working in the restricted areas in Britain's airports would need to have an ID card and it will be made generally available to British citizens from 2011. Those cards, which will be voluntary, may look different and display different information but they will enable the holder to travel without a passport around the EU. 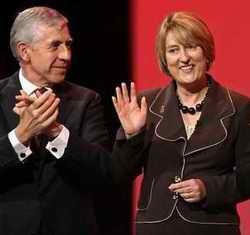 The Conservatives reaffirmed the party's commitment to scrapping ID cards if they win the next election, likely in 2010. Shadow home secretary Dominic Grieve said: ID cards are an expensive white elephant that risk making us less - not more safe. It is high time the Government scrapped this ill-fated project. Plans to build support for identity cards by introducing them among 'guinea pig' groups, such as airport staff and students, are in crisis after 10,000 airline pilots vowed to take legal action to block them and opposition swept through Britain's universities and councils. In a move that could wreck the government's strategy for a phased introduction beginning next year, the British Airline Pilots Association (Balpa) said it would seek a judicial review rather than see its members forced to adopt ID cards at a time when pilots are already exhaustively vetted. Balpa's vehement opposition is a hammer blow for the Home Secretary, Jacqui Smith, who had hoped to win the wider public over to ID cards by demonstrating that they were crucial to anti-terrorism policies. She intends to introduce them among groups who operate in positions of trust in our society. Balpa, which represents more than 10,000 pilots working on 28 airlines, backed by the Trades Union Congress, insists that ID cards will do nothing to enhance airport or flight security, and it fears that information about its members stored on a National Identity Register could be abused. Jim McAuslan, general secretary of Balpa, told The Observer: Our members are incensed by the way they have been targeted as guinea pigs in a project which will not improve security. We will leave no stone unturned in our attempts to prevent this, including legal action to force a judicial review if necessary. From late 2010 ministers intend to start issuing ID cards to young people , particularly students, on a voluntary basis in a further attempt to win the population round. Then around 2012 everyone applying for a passport will have to be on the National Identity Register. However, the anti-ID card campaign group, NO2ID, is mobilising what it says is a wave of student opposition to ID cards on campuses across the country. Jack: Have you got your ID card yet? Jacqui: Yes, but I lost it! Passport fees to jump by a third to more than £100 to pay for fingerprinting. The Home Secretary Jacqui Smith also revealed that the cost to taxpayers of new identity cards will double from £30 to £60. The huge rises were necessary to pay for taking facial readings and fingerprints for new biometric passports and ID cards. From 2012 identity and passport service estimates that around seven million UK residents will apply for a card or a passport - with each person having to provide their fingerprints, photograph and signature in person. This means that the additional cost of a biometric passport or identity card will be £28 each, on top of the £72 charge for a new passport. The cost of paying for an identity card will jump from £30 to £58. The fee for a new passport has increased fourfold in the past 10 years, from £18 in 1997 to £72 today. If the fee in 1997 had increased by the annual rate of inflation it would be £23.67 today. In a speech by Smith at the Social Market Foundation in London, Smith also revealed that some ID cards will be handed out next year to members of the public who were keen to have one. Anyone who wants a card can register their interest on a website. They would be then selected at random to become early adopters of the cards. The cards will enable holders to travel around Europe without a passport. ID cards will be compulsory for 20,000 airside workers at two airports - City of London and Manchester - from next Autumn, although the cost of registering them will be paid for by the Home Office. From Nov 25 this year, ID cards are compulsory for foreign nationals who come to Britain for more than a holiday. Brits who apply for or renew their passport will be automatically registered on the national identity card database under regulations to be approved by MPs in the next few weeks. The decision to press ahead with the main elements of the national identity card scheme follows a review by the home secretary, Alan Johnson. Although Johnson claimed the cards would not be compulsory, critics say the passport measures amount to an attempt to introduce the system by the backdoor. Johnson said he had halted plans to introduce compulsory identity cards for airline pilots and 30,000 other critical workers at Manchester and London City airports this autumn in the face of threats of legal action. Longer term plans to extend compulsory ID cards to other transport industries, such as the railways, as a condition of employment have also been scrapped. But two batches of draft regulations to be approved by MPs tomorrow and next week are expected to include powers to make the passport a designated document under the national identity card scheme. This means that anyone applying for or renewing their passport from 2011 will have their details automatically added to the national identity databases. The regulations also include powers to levy a fine of up to £1,000 on those who fail to tell the authorities of a change of address or amend other key personal details such as a change of name within three months. Johnson said he wanted to see the introduction of identity cards accelerated for foreign nationals resident in Britain and for young early adopters for whom they would act as a useful proof of age. This trial is to be extended from Manchester to other parts of the north-west. Isabella Sankey, director of policy at the human rights group Liberty, said the home secretary needed to be clear as to whether entry onto the national identity register was going to continue to be automatic when applying for a passport. If so, the identity scheme will be compulsory in practice. However you spin it, big ears, four legs and a long trunk still make an elephant, she said. Guy Herbert of the No2ID campaign said the pressing ahead with making the passport a designated document made a nonsense of the home secretary's assertion that the scheme was not compulsory: It is not compulsory as long as you don't want to leave the country. MPs have approved fines of up to £1,000 for those who fail to tell the passport and identity service of changes in their personal details including address, name, nationality and gender. The shadow home secretary, Chris Grayling, told MPs: One of the first acts of a Conservative government will be cancelling the ID cards scheme. The scheme and the register are both an affront to British liberty and will have no place in a Conservative Britain. They are also a huge waste of money. The Conservatives' home affairs spokesman, Damian Green, asked how the scheme could be voluntary when they were penalties for failing to provide information for the database: If it is a voluntary card, why are there penalties attached for failing to provide that information? he said, adding that the government should warn people that once they volunteer for a passport or ID card it was then compulsory for the rest of their lives. 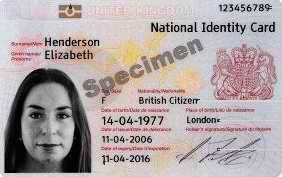 Home Secretary Alan Johnson has unveiled the final design of the British national identity card. The card will be offered to members of the public in the Greater Manchester area from the end of this year. Volunteering for a car will also incur a lifetime of having to keep the state informed of address changes etc under duress of enormous fines. Ministers plan to launch the £30 biometric ID card nationwide in 2011 or 2012 - but it will not be immediately compulsory. Opposition spokesmen said it was a colossal waste of money and civil liberty groups said it was as costly to our pockets as to our privacy. Ministers say the card, which follows the launch of the foreign national ID card, will provide an easy way of safely proving identity. The card is very similar in look to a UK driving licence but holds more data, including two fingerprints and a photograph encoded on a chip. This chip and its unique number in turn links the card to a national identity register which, under current legislation, will hold more information about the identity of the individual. If the scheme goes ahead, the card could be used as a travel document within Europe, separate to the passport, similar to arrangements between other EU member states. Like the UK passport, the front of the card displays the royal crest as well as the thistle, the rose, the shamrock and the daffodil to represent the four parts of the UK. No2ID, a national pressure group, is launching a counter-campaign across North-West England to derail the Home Office's plan. Dave Page, from the organisation, said: Once you are on that database, you can never come off it. From the moment you're registered you'll have to tell the authorities of any change in your circumstances for the rest of your life - and pay whatever fees they ask for the 'service'. You'll never know who's looking at your details. It won't protect our safety. It won't be convenient - except for Whitehall. This scheme is an expensive and dangerous con. ID cards will be history within 100 days, the government said as it published laws to destroy the scheme. The wasteful, bureaucratic and intrusive ID card scheme represents everything that has been wrong with government in recent years, said Deputy Prime Minister Nick Clegg: By taking swift action to scrap it, we are making it clear that this government won't sacrifice people's liberty for the sake of Ministers' pet projects. A separate ID cards scheme for foreign nationals will go ahead. 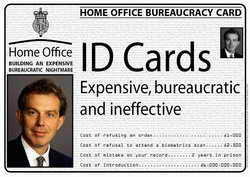 Labour's ID cards were officially trashed when the Bill to abolish them received Royal Assent. The few thousand cards that people bought voluntarily will be cancelled within a month. In addition, the database holding the biographic information and biometric fingerprint data of cardholders, known as the National Identity Register, will be physically destroyed within two months. The ID card scheme was symbolic of the last administration's obsession with control and nannying. It was put up as a panacea, capable of preventing everything from benefit fraud and illegal immigration to terrorism and organised crime. 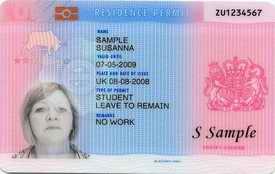 As of 22nd January 2011 identity cards can no longer be used to prove identity or to travel in Europe. The cards have been scrapped by the government under the Identity Documents Act. Within days the National Identity Register - which was designed to hold the details of card holders - will be destroyed. Laying ID cards to rest demonstrates the government's commitment to scale back the power of the state and restore civil liberties. It is about the people having trust in the government to know when it is necessary and appropriate for the state to hold and use personal data, and it is about the government placing their trust in the common-sense and responsible attitude of the people. The Identity and Passport Service (IPS) (new window) has written to all existing cardholders and informed international border agencies, travel operators and customers of the change in law. A database built to hold the fingerprints and personal details of millions of ID card holders has today been publicly destroyed. 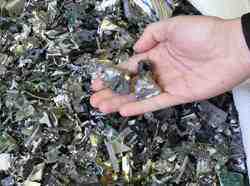 Around 500 hard disk drives and 100 back up tapes containing the details of 15,000 early adopters have been magnetically wiped and shredded. They will soon be incinerated in an environmentally friendly waste-for-energy process. This signals an end to the National Identity Register which was built to hold the details of people who applied for an ID card. The scheme was scrapped by the coalition government and the cards ceased to be valid legal documents on 22 January. Home Office minister Damian Green helped shred the last of the hard disk drives at an Essex industrial site today.